Fans of Joss Whedon shows had plenty to go wild about at Emerald City Comicon 2015 (March 27-29). As we wrap up our coverage of the convention, here are some pics from the Whedon-related panels (for the Agents of S.H.I.E.L.D. panels with Clark Gregg and Chloe Bennet, check here). Among the most popular celebrity panels of the weekend involved cast members from the short-lived cult favorite Firefly. Morena Baccarin (Inara in Firefly and its movie follow-up Serenity) was originally scheduled to appear, but cancelled due to scheduling conflicts. Jewel Staite (Kaylee) stepped in to take her place for an unmoderated solo panel on day one. No questions about her recent supporting role on The Killing, unfortunately, but there was a fans of her work on Stargate Atlantis. 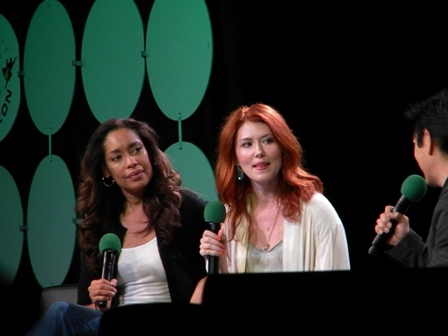 Gina Torres (Zoe) was on hand for a solo panel on day two. The best attended, however, was the standing-room-only day three panel with both actresses together. Because of the played team-up panel, it was requested that Q&A participants try to steer clear of Firefly-related questions. As a result there was much discussion about Torres’ current shows, Suits and Hannibal (on which she co-stars with real-life husband Laurence Fishburne, who sadly was not in attendance at this convention). The killer moment in the Staite and Torres panel came at the end. At the start of the panel, moderator Grant Imahara mentioned he had a “friend” who sent in some questions. That “friend” turned out to be Nathan Fillion, who had sent Imahara one question each for his former Firefly cast mates. The questions were inane (to Staite: “What did I name your dog when I dog-sat?” – among several nicknames was “What Dog”), but it was a fun moment for fans. Among the day one panels was “The Ladies of Buffy,” which featured Julie Benz, Charisma Carpenter, and Clare Kramer (who also doubled as moderator, as she – alternating with Imahara – was the convention’s regular moderator). The highlight of the panel was a Buffy the Vampire Slayer trivia challenge, with Carpenter’s team on the right side of the auditorium and Benz’s on the left. Both actresses copped to not knowing the answers to any of the questions. Benz’s team proved victorious.